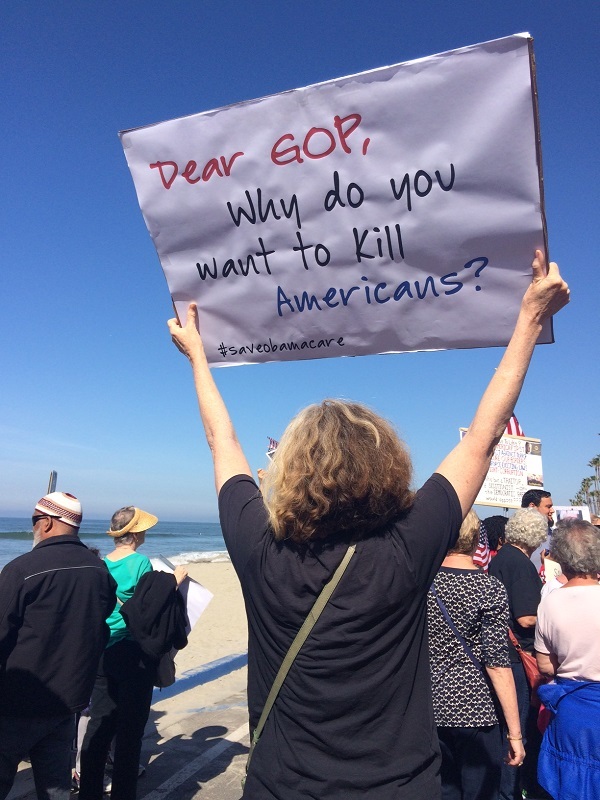 OCEANSIDE, Calif. (CN) – Eight-term Congressman Darrell Issa was greeted Saturday at his town hall by hundreds of angry constituents who asked pointed questions about the replacement to the federal health care law Republicans are seeking. It was the first Q & A the congressman has held with constituents who’ve been asking for a meeting since Issa was narrowly re-elected in November. 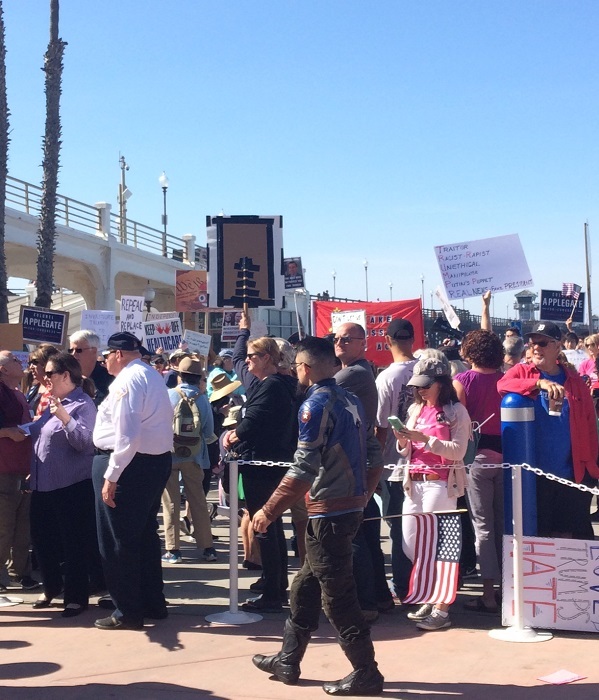 Hundreds of protesters from the nonpartisan group Indivisible North San Diego County have showed up at Issa’s district office every Tuesday for “Resist Trump Tuesdays,” asking to meet with the congressman. 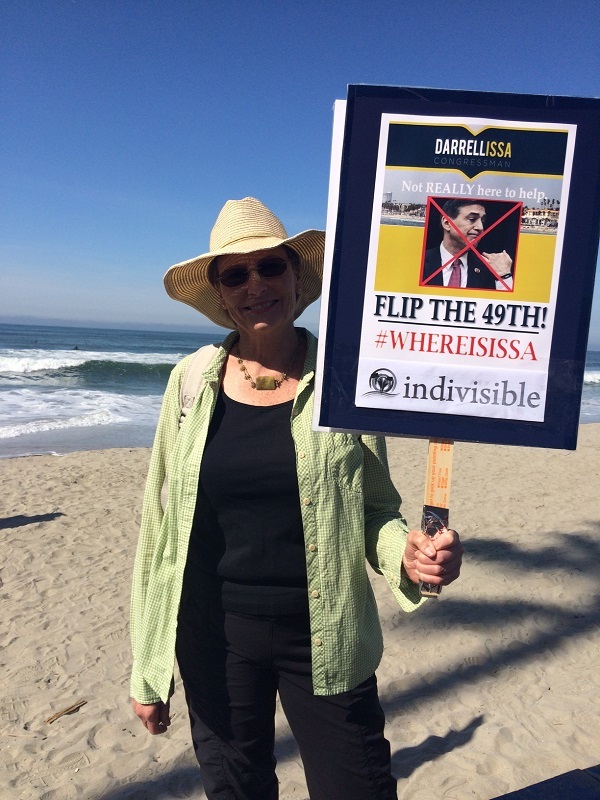 Protesters even raised $6,000 for a full-page ad in The San Diego Union-Tribune asking for a town hall meeting with Issa. Issa’s office announced the Saturday meeting on Thursday and required constituents to register ahead online. 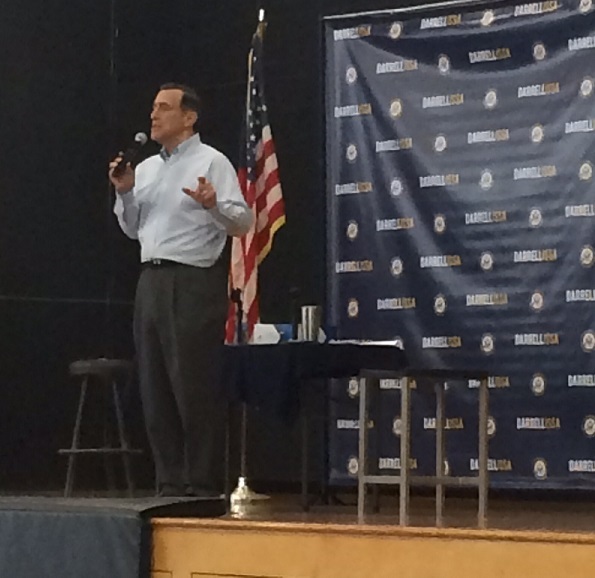 Issa held two Q & A sessions early Saturday morning, with 500 constituents at each session. 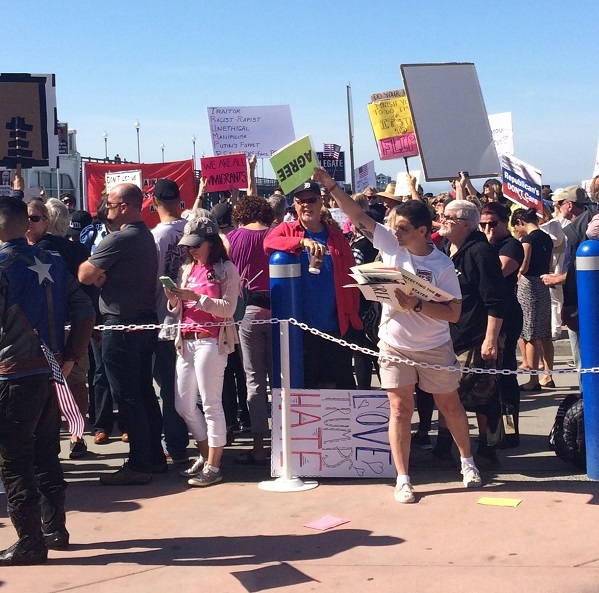 While space was limited inside the Junior Seau Community Center steps away from the Oceanside Pier, that didn’t stop hundreds of protesters holding signs and blowing horns from gathering near the beach to have their voices heard on issues Issa will vote on in coming weeks. Carlsbad resident James McLane said he wanted to ask Issa who would fill all the jobs being done by the undocumented immigrants President Trump and his party want to kick out of the country. He was also concerned about Trump’s ties to Russia and said he’ll be affected “more than most” by the recently introduced American Health Care Act because of his age. 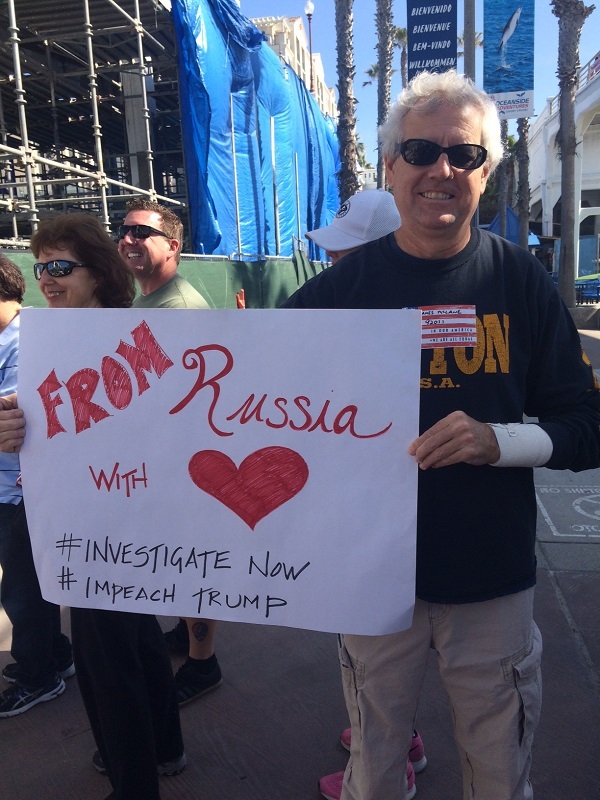 Jody Hubbard of Encinitas said she never felt the need to protest until after the election. Hubbard, 60, said she attended the Women’s March and a march for Planned Parenthood because “social issues are the most important to me,” though she considers herself a fiscal conservative. Hubbard, who is self-employed, said she has to pay $700 a month for health care and doesn’t get any subsidies for it, but she’s happy to pay it knowing she and others can get coverage. 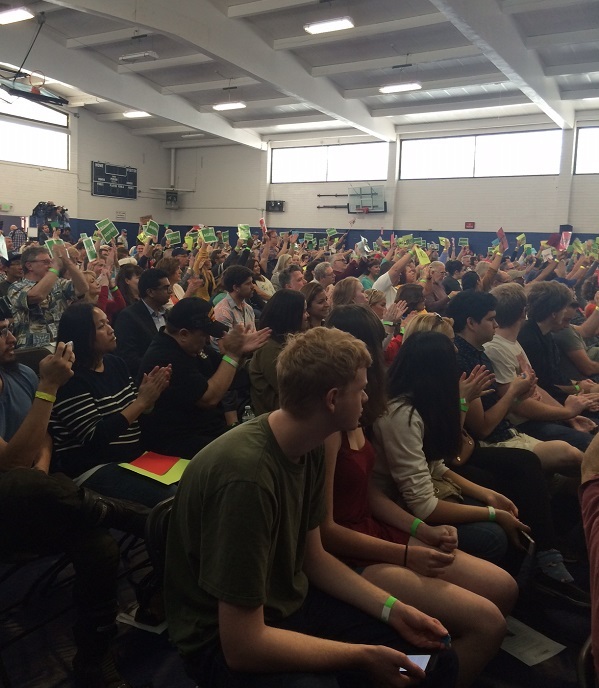 Inside the beachside community center, Issa was greeted by hundreds of constituents waving bright green and red “Agree” and “Disagree” signs. While the town hall was advertised as a conversation focused on the recently introduced Republican option to replace President Obama’s Patient Protection and Affordable Care Act, many constituents asked about Russian ties to the Trump administration, and whether they would be investigated. Raffle ticket numbers were called so questioners could be chosen at random. Many audience members yelled, “Answer the question,” or, “Yes or no,” when they felt Issa failed to address an issue. Others spoke out of turn or tried to talk over him, yet the event remained mostly civil. Perhaps kowtowing to the mostly liberal audience, Issa pointed out he was the first Republican to call for an independent investigation into Trump’s ties to Russia, and said he would continue to “push to ensure the investigation is transparent” and called Russians “bad actors” who interfered in the presidential election. “When you elect a member of Congress, you don’t elect them to worry about potholes in Cleveland, you elect them to worry about our national security,” Issa said. Issa was met with cheers when he disagreed with his party on another contentious issue: Planned Parenthood. He said he would not let Planned Parenthood be defunded, as is outlined in the first draft of the American Health Care Act, which the Trump administration insists should not be called Trumpcare. “I went off to college in 1972, just at the point that Roe [v. Wade] became the settled law of the land. For many people in both parties, but disproportionately in my party, they think that it’s not settled. I will tell you that it’s clearly been settled. … Planned Parenthood and other groups will continue to be funded and I will make sure of that,” Issa said. Issa said “we’re never going back on” popular Affordable Care Act provisions such as no denial of coverage for preexisting conditions and allowing children to stay on their parents’ plan until they’re 26. But he was roundly booed when he reiterated a statement by Congressman Jason Chaffetz, R-Utah, who said last week that people could afford health care if they refrained from purchasing a new iPhone. Issa deflected a question about reducing the cost of health care which one constituent said were inflated due to the “multibillion-dollar health care business” and the greed of insurance CEOs. Issa said health care costs could be reduced by preventing hospitals and doctors from overprescribing out of fear of being sued for malpractice. “Doctors make 100 percent of the decisions about your health care. Putting you in the hospital is a doctor’s decision. Pharmaceutical prescriptions are doctors’ decisions. We need doctors here and hospitals here to work more like they do in Canada and Britain because they prescribe less, since they’re less afraid of being sued,” Issa said. Issa also diverged from his party line on the border wall with Mexico, saying San Diego County’s congressional delegation know best how to continue building a relationship with Mexico. He said the dual fences on the border in San Diego and Imperial counties allow Border Patrol agents to better do their job since they can drive between the fences and have a good line of vision which ensures the safety of both agents and migrants. He said he’s “less interested in prosecuting the undocumented worker” and more concerned about nabbing the coyotes, or body smugglers, who bring people across the border. Issa said he has “championed for years” building a sewage treatment plant in Tijuana, “so we don’t have sewage on our shores,” as happened recently due to a breach in the system. San Diego’s relationship with Mexico, particularly when it comes to trade, is “why our economy does well,” Issa said. The 2016 election was the first time Issa face a serious challenge since he first ran for Congress in 2000.